Nancy currently resides in White Plains, New York with her family. An alumna of Saint Francis College in Brooklyn, New York, Nancy earned a Bachelor of Science in Business Management and later earned her MBA in Organizational Development from Long Island University. 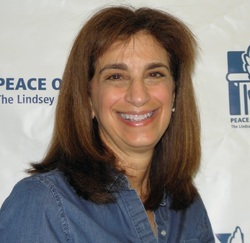 She currently serves as Senior Vice President of Human Resources at the Mental Health Association of Westchester. In 2011, Nancy’s daughter attended a Teens ‘N Transition presentation at White Plains High School. Nancy was so grateful for the wealth of information that her daughter received from PEACE OUTside Campus, that she began to volunteer with the Foundation. Over the years, Nancy has served on various planning committees for the Lindsey 5K Run/Walk and Lindsey Night Gala. Due to her overwhelming passion and dedication to the mission, Nancy was asked to join the Board of Directors in September 2014. PEACE OUTside Campus is honored to have such a passionate, dedicated, and selfless member join the Board of Directors.